Established as the county seat of Bleckley County in 1869, Cochran is named for Arthur E. Cochran, president of the Macon and Brunswick Railroad at the time of establishment. With a population of approximately 4,500 people, Cochran exemplifies small-town southern living at its best. 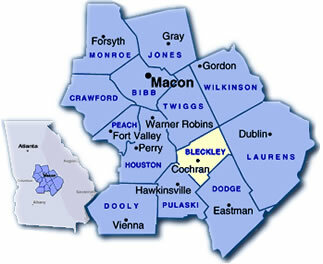 Bleckley County is the 145th county formed in Georgia. The county was named for Georgia Supreme Court Justice Logan E. Bleckley, who was a poet and philosopher, as well as a solider. After serving in the Confederate Army during the Civil War, Bleckley resumed his law practice, served as an Associate Justice of the Supreme Court from 1875 to 1880 and was named Chief Justice in 1887, a position he held until 1894. Are you moving to Cochran or relocating to Bleckley County?